For testing we used FRAPS to record 60 seconds of gameplay as we make our way from the Red Rocket gas station down to Concord, the first town you’ll inevitably run into. The time of day is in the late afternoon, so there are certainly going to be examples of volumetric lighting to stress the cards. 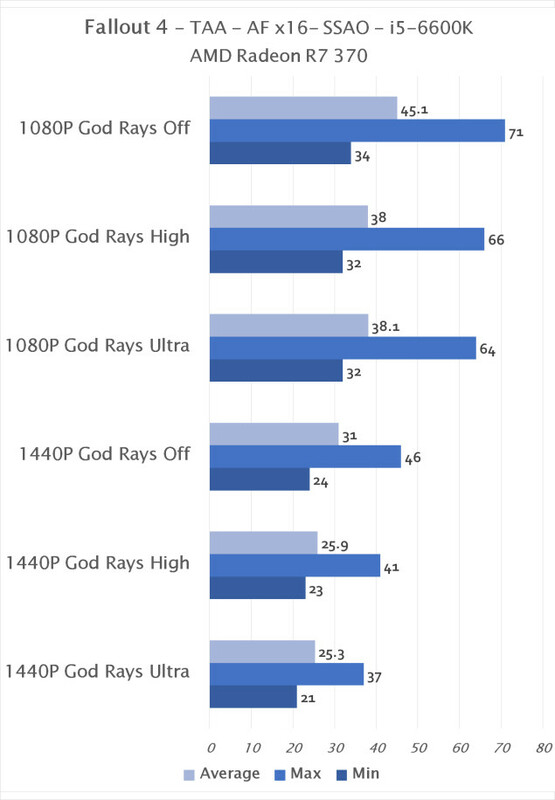 We test a multitude of cards in our test bench at 1080P and 1440P with God Rays on Ultra, High and then with them off. TAA was the anti-aliasing method used and anisotropic filtering was set to x16. Bokeh depth of field was used and ambient occlusion was set to SSAO (high). Additional rendering features such as screen space reflections, wetness, rain occlusion, motion blur and lens flare were also enabled. Thank you to ASRock for lending us the Z170 Extreme 4 for our test bench. 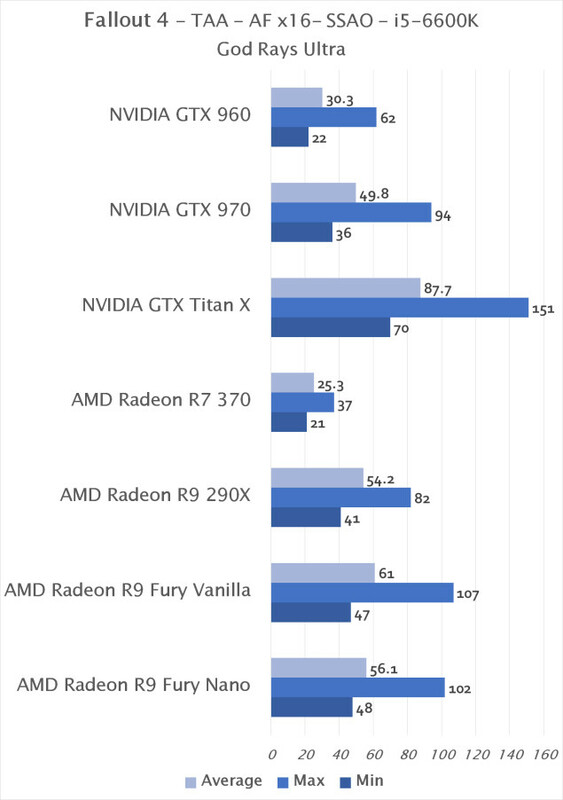 For this test we’ve replaced the GTX 980 (which was only borrowed anyway) with a GTX 970 to further represent a wider price range of NVIDIA cards. 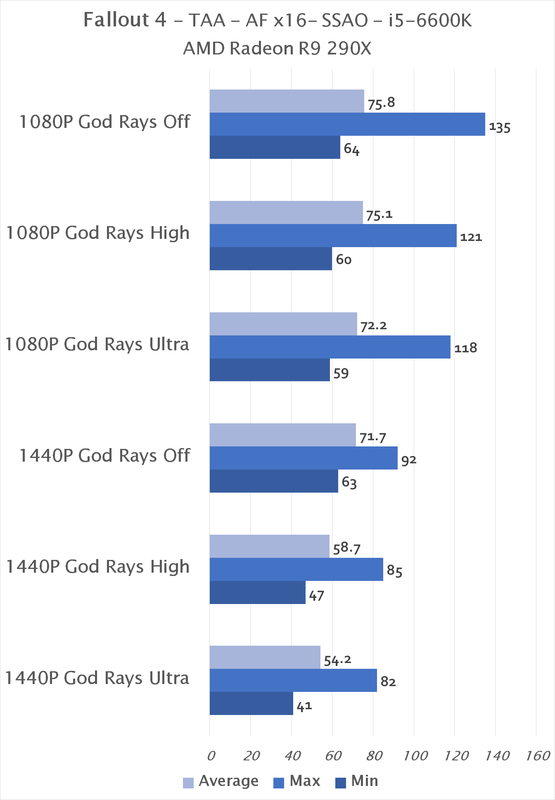 For our graphs, we’ll show how each card performs with the different levels of God Rays enabled in an attempt to determine whether or not they play a significant role in performance when they’re rendered at an average rate. First lets look at all the settings on their highest and look at all the various AMD and NVIDIA cards together at 1440P, then we’ll look at them separately. Well, there it is, that’s how everything performs against one another. But let’s delve a little deeper into what God Rays do to performance for each card. Right away we can see that God Rays do have an effect, though it seems to be rather slight. Granted, this scene isn’t inundated with them as a radiation storm or immense amounts of fog might be, but this is a typical scene in that it has an average amount of volumetric lighting. It’s a good showing thus far, and it seems to be somewhat well optimized. Let’s take a look at the rest of the AMD family, and then the NVIDIA family. All in all the performance is great. It’s stable and runs without significant slow-downs or stuttering on any of the cards. 1440P is quite the stretch for the R7 370, but then it isn’t recommended at that resolution anyway. 1080P is where it does quite well, and does so strongly. 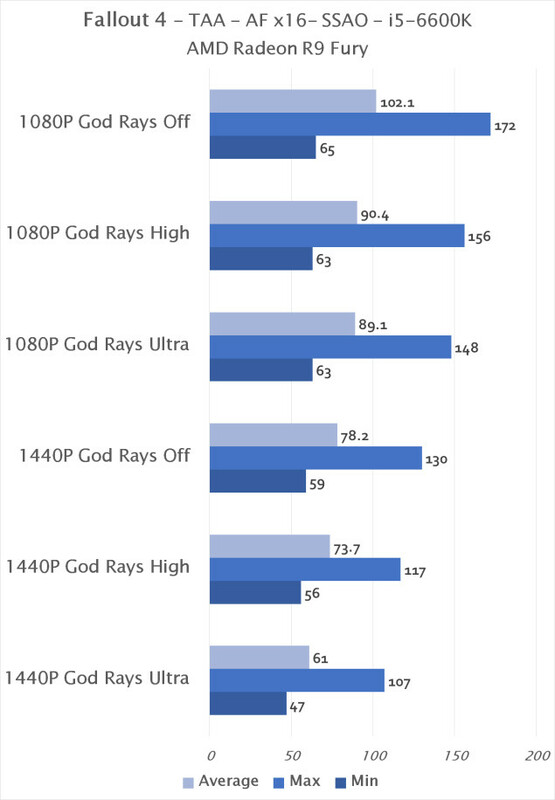 God Rays have a very insignificant impact during an average scene, with only a 13% decrease in average performance when set to Ultra on the Fury at 1080P and as much as an 18% detriment in performance on the R7 370, which is due to having fewer CU’s to offload tessellation specific tasks to. That isn’t nearly as large a gap as expected. Now let’s look at how Fallout 4 performs on NVIDIA hardware.